It’s important to be prepared to talk about money when you’re interviewing for a new job. Interview questions about salary can be quite tricky. 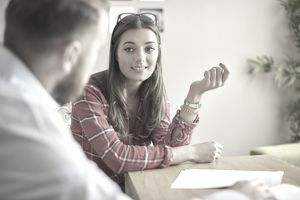 It is one circumstance where you and the interviewer may have sharply opposing goals: you're eager to get the highest possible salary, while the hiring manager likely wants you to accept the lowest possible amount within the job's salary range. In some locations, companies aren't allowed to ask how much you have earned in the past. In others, it is fair game. And, while you don't want to low-ball yourself and wind up with a rate that's lower than what the company is willing to pay, you also don't want to shoot too high and remove yourself as a viable candidate. Answering job interview questions about salary can feel like navigating a minefield, but with research and advance planning, you can develop a strategy that will ensure that you are paid a fair salary. Below, see the toughest and most common interview questions about salary and get advice on the best way to respond to them along with sample answers. Evaluate What the Position Is Worth to You Given Your Overall Criteria for an Ideal Job: You might be willing to accept a somewhat lower salary for a position that provides growth potential, helps you acquire cutting-edge skills, accommodates your lifestyle, is ideally located, or bridges you to a new industry. On the other hand, if you have reservations about how well the job fits your situation, then you might convey a higher salary expectation figuring that you have less to lose if you price yourself out of a job. Provide a Range: Experts suggest that you give a range, rather than an actual number. If you are offered the low-end of your range, you could use that as an opportunity to request other non-salary benefits or perks, such as reimbursement for classes, vacation days, etc. Do Your Research: Not only should you know the average salary for your industry, but it's also wise to know geographical information as well. A nurse in Alaska and a nurse in New York will not necessarily earn the same salary. Salaries can vary widely based on the cost of living in the area, as well as the number of qualified applicants nearby. Use sites like Glassdoor, Payscale, and Salary.com to research salaries. Play It Coy: Typically, experts recommend that you avoid saying a number first. You can say something like, "I'd need to know more about the position and its responsibilities before thinking about salary." Keep Your Cost of Living Needs in Mind: It can feel very game-like to negotiate a strategy, but it's important to keep your financial needs front and center. Will the salary you request cover your expenses? If not, how will you make up the difference? Weigh your needs against the research you've done about salary - If the two numbers aren't close to each other, it could be a sign that the job isn't a good match. Get Information From the Interviewer: Use this question as an opportunity to flip the tables on the interviewer and find out what the salary range is for the position. You can ask: "What's the range that you have in mind for the position?, " What is the established salary range for staff in similar jobs with a background like mine?" or "What are some non-salaried benefits that are available?" Honesty Is the Best Policy: It can be tempting to fudge the numbers on your previous earnings. Will anyone know the difference if you round up? It is possible that employers will verify your compensation at previous job(s), so being truthful is essential. Here are some of the most typical questions interviewers will ask about salary. Click to see the best answers. Salary negotiations are not over once you receive an offer. The first offer made by an employer is often not the highest possible salary that you might secure. Be ready to concisely articulate what is special about you as a candidate that justifies placing you at the higher end of the range for the job. Think of the offer as the opening gambit in a game. Here are five things to evaluate when you receive an offer. If you don't think the offer is adequate or suspect that the company is giving a low number anticipating that you will negotiate, you may want to make a counteroffer. Here is information on how to negotiate a counter offer. If you do try to negotiate after you have received an offer, be aware that the company does have the option of rescinding the offer so only negotiate if you are prepared for that level of risk.